Motorola XOOM 3G customers waiting on the promised 4G LTE upgrade for a while now. Also they’ve been a little worried lately as rumors about a new tablet spread which could mean that the company would leave previous customers in the cold. Well, luckily it not goint go happen like that. The company has just begun sending out emails to confirm with customers that the upgrade will be happening sometime in September. 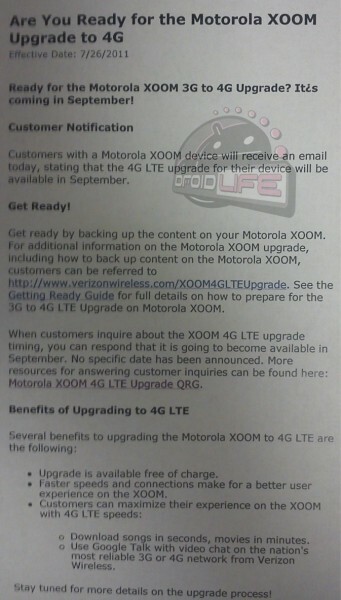 Fellas from DroidLife got an internal memo informing employees about the upcoming Motorola XOOM 3G to 4G update which customers today will be receiving an email about — letting them know about the good news. The upgrade from 3G to 4G LTE will be free, but requires customers to send in their tablets for Motorola to install a mini PCI module to support LTE speeds. So don’t forget to backup all your content as Motorola advises. 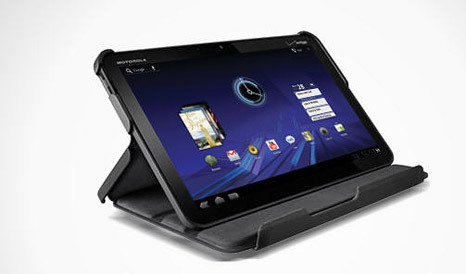 So a recent FCC filing of a 4G LTE Motorola XOOM is not turning out to be the rumored second-generation Motorola XOOM tablet, which would have left many XOOM 3G customers frustrated, especially after the promised feature had been delayed for several months.